Impending jubilation was just moments away, the champagne was placed in a bucket with ice and the crowd of spectators was momentous in comparison to previous games. 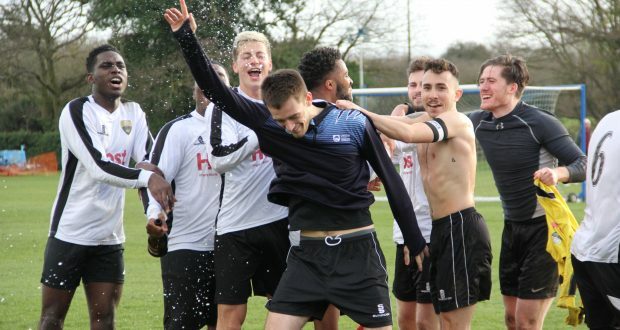 The game against London School of Economics was a mere formality as Kingston had already won the league. The final whistle sounded and for only the second time this season Kingston had recorded a defeat. The touchline was filled with players past and present, friends and girlfriends. Though Kingston had conceded late and failed to record a point there was no stopping the euphoria, their overall achievement would not be blighted by an unfortuitous game. 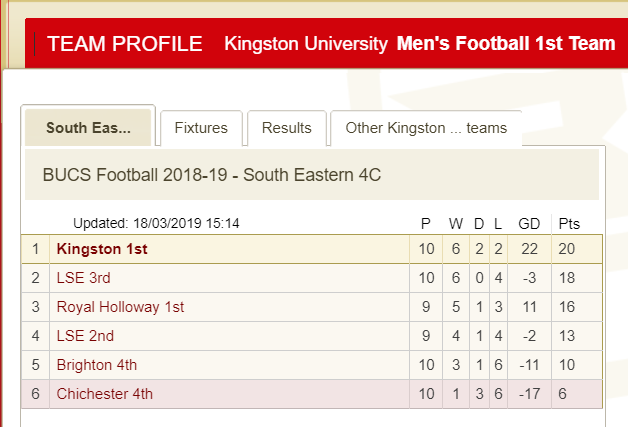 Kingston’s season has had moments of clinical football and on more than one occasion they have beaten their opponents handsomely. Their well-rehearsed set-pieces in training have led to moments of brilliance from free kicks and vital goals from corners. As a unit, they have become more organised as the season continued and their discipline under coach Besim Ali has been remarkable. 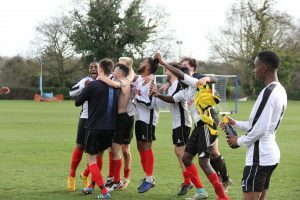 Ali, the Head of Academy Analysis at Fulham football club, has provided a mid-tier university football team with the experience gained from professional football. Ali said: “It’s a fantastic achievement and full credit to the boys because they’ve worked so hard all throughout the year. In terms of training they look after themselves by going to the gym on Fridays and tactically they’ve been spot on, listening to all of my analysis. As a team, Kingston have a variety of semi-professional players who bring flair and talent to the team. Santiago Navarro is one of these players and despite the uninspiring performance from KU in the final game of the season, he showed moments of pure brilliance. But despite their out of character performance against LSE, the Kingston team still have a remarkably balanced roster of players who each bring different attributes to the team. The defensive partnership of captain Oscar Kotting Mcmillan and Simon Salomone has prevailed in many games this season and players such as Kehinde Aliu and Olly Cox have provided much needed defensive support at critical moments. From an attacking perspective, Kingston have been deadly down the wings. 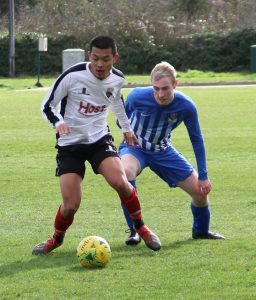 Pranav Thapa Magar, on bursts forward, has showed what a technical and speedy player he is and has caused many of the teams in the league problems. 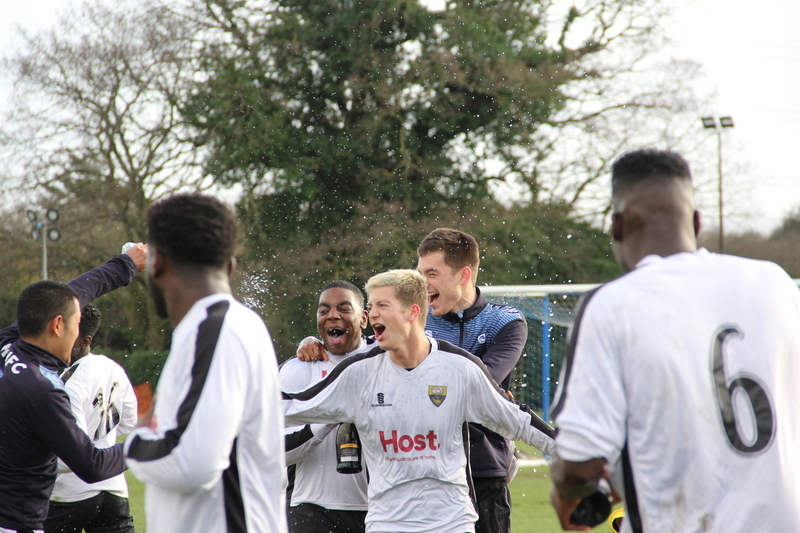 Henry Awu and Kelvin Adjei have demonstrated their pedigree on the wing, and alongside Saif Khan and Joseph Headley have been rewarded for their efforts with many goals this season. The team’s performances have not gone unnoticed and Mark Pembridge, former player and current coach of Fulham’s under 23s, was in attendance to give feedback to the players after the game with LSE. Earlier in the season Kotting Mcmillan disclosed that he did not feel Kingston’s first team should be playing in a league with so many second, third and even fourth teams. 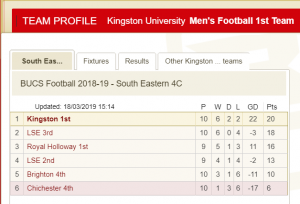 Kingston and Royal Holloway, who lost out on the title, were the only teams in the league who consist of their University firsts teams. University sport is unpredictable. Third years graduate and star players are lost and not necessarily always replaced when the pool of talent from next season’s first years arrives. Kingston themselves will lose a number of their talented players as a sizable amount of their players will graduate this summer. This will provide the opportunity for players in the second or third team to make a bid for the first team and also for new stars to emerge once the new firsts years arrive. In the higher league, Ali, who has disclosed he would like to continue to coach the side, and second-year Kotting Mcmillan, who will hope to continue to captain the side, will provide all of their experience and expertise to gain Kingston to even more footballing success. Kingston’s hard-fought season ended with them winning the league.